Employers may be liable for the negligence of their employees when their employees injure others during the course and scope of their employment. Employers hold vicarious liability for the negligent acts of their employees while they are acting in the course and scope of their jobs. In Jay H. et al. v. John Keith Bullard, Waterfront Enterprises, Inc., dba Newport Landing Restaurant and Oyster Bar, et al., Orange County Superior Court Case No. 30-2014-00718428-CU-PA-CJC, the limits of the employer’s vicarious liability were explored. On March 6, 2014, at 7:30 p.m. the defendant, Jon Bullard, was headed home after finishing his shift at the restaurant that he managed. He was the manager of the Newport Landing Restaurant and Oyster Bar, which was owned by Waterfront Enterprises. When he reached the intersection of Thalia Drive and the Pacific Coast Highway, Bullard pulled into the middle of the intersection in order to make a left turn. While he waited for the traffic heading in the opposite direction to clear, the traffic light turned yellow and then red. 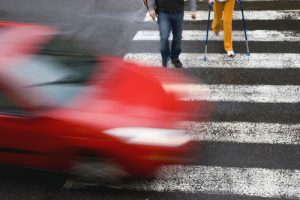 He proceeded with his left turn and struck some pedestrians who were crossing the street in the crosswalk. Bullard pulled over and called 911. Both of the pedestrians had been knocked down by his truck. The plaintiffs had to go to the hospital by ambulance for treatment. The plaintiffs argued that Bullard was acting within the scope and course of his employment at the time of the accident. They also argued that one of the plaintiffs, Jay H., suffered a traumatic brain injury along with numerous fractures. Finally, they argued that all of the defendants should be responsible for the economic and noneconomic losses. Bullard admitted liability, and the jury found after the first part of the trial that he was acting in the scope and course of his employment when the accident happened. During the second phase of the trial, the defendants argued that Jay H. suffered from either a mental health disorder or from ongoing stimulant abuse rather than from a traumatic brain injury. Plaintiff Julienne Dawson reached a settlement with Bullard for his policy limits of $50,000 and with Waterfront Enterprises for $300,000 before trial. Jay H., the remaining plaintiff, submitted a §998 demand in the amount of $4,850,000.00 to defendant Waterfront Enterprises, Inc. dba Newport Landing Restaurant and Oyster Bar. During the trial, he made a demand of more than $10 million. After the trial, the jury deliberated for 15 days before returning its verdict in favor of the plaintiff. They issued a gross verdict of $1,013,443.20. Of that amount, the jury awarded the plaintiff $293,443.20 for his past economic losses, $20,000 for his future economic losses, $475,000 for his past noneconomic damages, and $225,000 for his future noneconomic losses. California law follows the principle of respondeat superior, which means that an employer is vicariously liable for the negligent actions of an employee while the employee is working within the scope and course of his employment. In this case, Bullard had already gotten off from work and was driving home when the accident happened. Under the going and coming rule, employers are generally not liable for the negligence of their employees when they are either commuting to or coming home from their jobs, according to the ruling in Lobo v. Tamco, 182 Cal.App.4th 297, 301 (2010). There is an exception to this rule, however, which is called the vehicle use exception. According to California Civil Instruction No. 3725, an employee is acting within the scope and course of his or her employment when his or her employer requires that the employee drives to and from his or her job so that his or her car is available to use for the employer’s business. If the employer derives some type of incidental or direct benefit from the use of the employee’s vehicle while the employee is at work, the time spent commuting to and from work will also be within the scope and course of the employment. In Jay H.’s case, the jury found during the first phase of the trial that Bullard was acting within the scope and course of his job because the vehicle-use exception applied. Evidence was presented at trial that Bullard was asked to use his car while he was working to run errands for his employer. The jury found that that was sufficient for the vehicle-use exception to the going and coming rule to apply so that the restaurant was vicariously liable for Bullard’s negligence on the way home from his job. This case demonstrates the importance of getting help from an experienced Los Angeles personal injury lawyer if you have been injured in an accident that was caused by someone else. While Bullard’s policy limits for his insurance were apparently only $50,000, the restaurant for which he worked had an insurance policy with much higher limits. By identifying this additional source of recovery, his attorneys helped him to recover far more than he would have if he had only pursued the driver. An experienced lawyer will look for all of the defendants who should be named in order to secure additional sources of recovery. If the negligent driver was either driving to or from his or her job when the accident happened, the attorney may examine the employee’s work responsibilities in order to determine whether or not the vehicle-use exception might apply. This may help injured victims to secure fair compensation that covers all of their economic and noneconomic losses. Contact our law firm today to learn about the recovery rights that you might have in your own case.